This is the second in a series of three conversations with John Johnson that we are posting this week. The first was about graduate admissions. If you’re a long-time Astrobites reader, I’m sure you remember the two excellent guest posts that John Johnson, Assistant Professor of Astronomy at Caltech, contributed last year (here and here). John recently founded the ExoLab at Caltech, where he mentors several graduate and undergraduate researchers. This week, we were lucky enough to have John visiting us at the Center for Astrophysics and we sat down to discuss the role of undergraduates in resarch. In our first article in this series, John described a trend he has observed where research has played an increasingly important role in undergraduate education. So what can you do to ensure a good experience as an undergraduate researcher? John says that effective communication with your advisor is absolutely key to making the most of your research experience. He says his group works best when his students keep him up to date — both in personal meetings and through email. He says his mind is constantly filled with streams of thought to help each project his students are working on (he calls these his “subprocesses”). But he can’t help them if he doesn’t know where they’re stuck. Today I implemented the [new analysis] we discussed. I got my code to produce reasonable results, but I’m surprised by [one particular problem]. I expected to see [different result] instead. Can you look at the attached plot and help me decide if I did [one thing] right? I would like to figure this out before the new data comes in next week, so it would be great to have your feedback before Monday. Of course, this mode of communication might not be optimized for every student-mentor relationship. How do you know what will work best for your advisor? John has a good suggestion: ask them — they will probably be glad you did. John reminds us that good communication with your advisor is important not only so you can do productive research with them, but also so that you leave a good impression. When you apply to your next position (be it graduate school, postdoc, or anything else), one of the most important parts of your application will be letters of recommendation from those you have worked with. If they don’t feel that they know you well — or, worse, if you did not get along well — it’s unlikely that they will write something that reflects favorably on you. There are a couple things you can do to “engineer,” as John says, good letters of recommendation for yourself. First, you should make a conscious effort to work with several different advisors (many fellowships require four letters of recommendation). If you collaborate outside of your home institution, that’s even better. Second, demonstrate to your letter writers that you are not only competent, but also that you can take the lead on your project and contribute original thoughts. The best way to accomplish all of these goals is to give yourself a head start. Get involved in research as early as you can, and spend time building relationships with people. John Johnson says that the learning curve for doing research is not linear – its exponential. You’ll under-predict your potential if you predict your future abilities with a low-order Taylor expansion. Unfortunately, regardless of how well your research goes, every graduate student, in any field, will experience hopelessness. It’s hard not to feel hopeless when you spend a month struggling with a problem, and then watch someone else solve it in about five minutes when you ask for help. An experience like this is not wasted time, though, it’s just part of the learning process. John explains the situation this way: the learning curve for research is not linear, it’s exponential. You’re getting better at what you do much more rapidly than you realize. As human beings, John says, we have a tendency to take low-order Taylor expansions to evaluate our progress at any given moment. 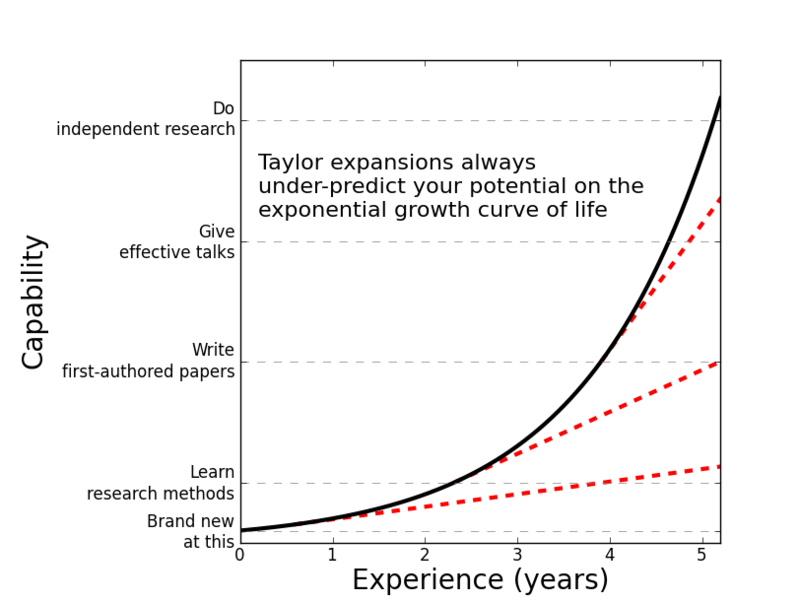 But this will always-under predict your potential on an exponential growth curve (see figure above). If you’re working on a problem in your research that seems impossible and you can’t imagine doing this for the rest of your life, remember that if you ever do it again it will be infinitely easier because of the work you’re doing now. We thank John for sharing his time and wisdom. In the final article in this series, we will discuss John’s new group at Caltech, the ExoLab.